The face of marketing has changed due to its digitalisation. Start-ups as well as businesses are trying hard to stay in the race as modern technologies and dominance of Digital Marketing is ever expanding. No wonder digital marketing is the best way to reach out to the targeted groups because most of the information is consumed by the audiences through online platforms. Currently, numerous organisations are utilising digital methods and digital advertising techniques. 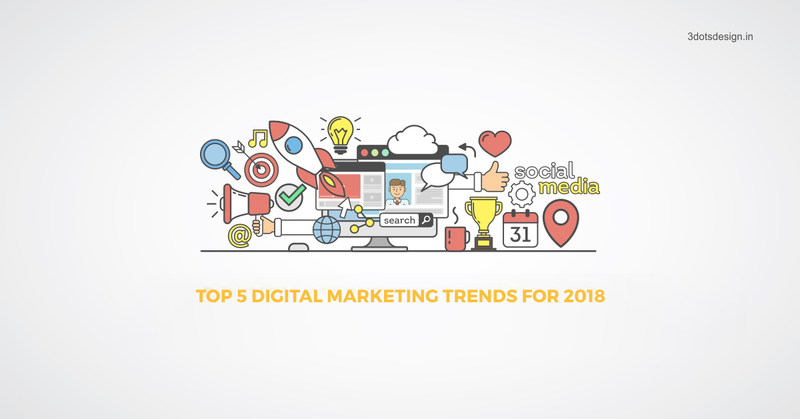 Here are top 5 digital marketing trends for 2018. The most popular among the digital marketing strategies is Content Marketing. Being one of the most used digital marketing tools, it is growing day-by-day. With an intention of drawing interests and transforming views; relevant, valuable and absolutely free content is created and shared. With a purpose of running profitably and to attract and gain a distinctly defined target group, content marketing is used widely. The type of content that is shared is pertinent to your business and your product. The agenda is that, people should reach, like and trust you to trade with your organisation. Last year many major brands have seen a rise in the video-sharing. A video delivers informative content while being entertaining at the same time. Its impact is deep as it is visually engaging for the users. It is the most eye-catching content whether you are marketing your business on Facebook, Instagram, Snapchat, YouTube or Twitter. Video helps to get your point across faster and sends out a more convincing message which can improve sales. Producing quality video content for users and marketing by connecting empowering messages with genuine descriptions is the key. In some cases, adding animation to a post can be just as effective in catching a user’s attention. Due to huge popularity and increasing users social media platforms have been in focus of online marketers for a long time now. Users are constantly hooked to different social media platforms providing the online marketing professional an opportunity to market and advertise. Today social messaging apps are not just for chatting with friends. Billions of users are active on Whatsapp, Facebook, WeChat, Youtube, Instagram for communicating regarding their businesses with their clients. Users in the current time expect a personalised online experience including communication with businesses and brands. Artificial Intelligence has made it quite easy for marketers to understand the consumers and develop even stronger connections with the help of technologies associated with it. The brands can now customise campaigns based on the buying behaviour and interests of online users with this new age technical breakthrough. 24/7 assistance can be provided to your consumers with Chatbots while collecting valuable data. This data can be further used for campaigning. So, data is surely changing the way businesses are done. Be it, Siri or Alexa, commanding and enquiring about anything and everything is clearly not difficult today. It sure qualifies for one of the best mediums for advertising and marketing in this current digital world. The wide use of voice search has made it quite essential for businesses to rethink their digital marketing strategies hereafter. A huge number of searches will be voice searches in the coming years. Even mobile searches, as well as Bing searches, are mostly voice searches today. It provides relevant information that the users are searching for through audio content. Social media stories are growing in popularity on all the social media platforms and marketers need to consider this essential format in their digital marketing strategy. The coming year is going to be all about better customer experience with personalisation, automation and AI-powered technology. Marketers need to produce audio and video content that is interactive in nature with your target group.